Legend has it that famed Spanish explorer Juan Ponce de León set sail not just to survey the New World, but to seek out the fabled “Fountain of Youth.” This was a mystical water source that primordial folklore promised could cure a man of all his ailments and keep him looking and feeling young forever if he simply sipped a splash of its crystal-clear deluge. Ponce de León and his crew traveled to what we now know as Florida in search of this panacea. However, he was only to discover (with much disappointment), that this land of palm trees, sunshine, and year-round warmth provided no such elixir from any of its natural springs. Like any famous tale, there’s probably more myth to the legend of Ponce de León’s excursion than actual fact. But historical records do show that almost all civilizations (both past and present) have revered the idea that somewhere out there is a cure-all for human conditions. Whether it be miracle waters or some kind of “magic” herb… it is just waiting to be discovered by a brave and adventurous soul seeking it out for the benefit of humanity. It’s a hopeful thought that, again, seems to be more the subject matter of an imaginative fantasy novel than the real world in which you and I live. But what if I told you that a “Fountain of Youth”-type elixir does, in fact, exist? Long prized as a life-extending “miracle” herb in Ayurvedic medicine, the plant I’m about to cover is arguably one of the most comprehensive healing substances known to man. And, I’m excited to share with you its many scientifically-proven health benefits. Known more commonly as ashwagandha or Indian ginseng, withania somnifera has long held a prominent place in Ayurvedic medicine. Its use dates at least as far back as 4,000 B.C. The traditional Indian approach to healing involved using ashwagandha as a “Rasayana.” In Sanskrit this literally means “that which negates old age and disease.” The life essence, so to speak, of Ayurveda, and one of functional medicine’s most precious herbs. The prefix “ashwa” translates as “horse,” the implication being that consuming this herb gives one the power of a horse. 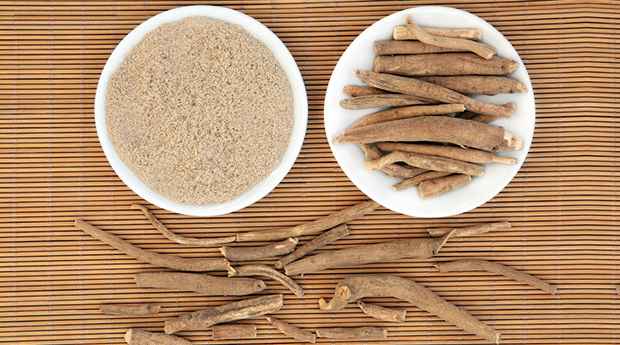 Ashwagandha’s many benefits include its narcotic, diuretic, aphrodisiac, anthelmintic, astringent, stimulant, thermogenic, and tonic properties. It also has benefits of adaptogenic nature. Adaptogens, in case you weren’t aware, are herbs that modulate the body’s stress response, adjusting hormones and other substances either up or down depending on what the body needs. The stress hormone cortisol, for instance, can cause all sorts of health problems when left unchecked. Think irritability, weight gain, diabetes, and heart disease. The ashwagandha plant has the ability to normalize cortisol levels and protect the body from harm. Ashwagandha is also powerfully rejuvenating, helping to energize the body, strengthen immunity, and balance hormone levels. All of these have the effect of making a person look and feel younger. 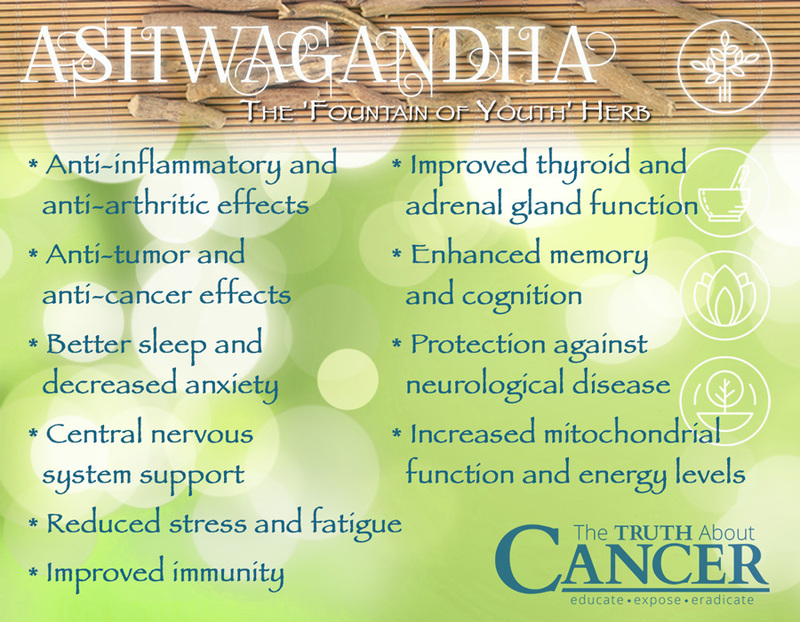 As you can see, the uniquely adaptogenic nature of ashwagandha makes it a potent remedy for nearly every facet of health that needs correcting or balancing. Unlike pharmaceutical drugs and other therapeutic substances that directly alter a specific cellular function or gene expression in order to address a particular set of symptoms, ashwagandha helps the body to self-adapt. It does this in order to facilitate proper rest, energy production, metabolic function, hormone modulation and various other functions. When it comes to cancer, ashwagandha has demonstrated powerful benefits in the treatment of cancer − including that of the lung and prostate. The most biologically active form of ashwagandha is said to be Nagori ashwagandha, though wildcrafted varieties have a similar composition. It is complete with all the alkaloids, withanolides (steroidal lactones), saponins, fatty acids, amino acids, choline, and the various other anti-stress and immunomodulatory agents that make it such a powerful medicine. Ayurvedic health experts recommend consuming this variety as a fresh powder made from the roots of the plant. However, the leaves, flowers, and seeds can also be beneficial when prepared for other purposes. Since ashwagandha is an herb, and a relatively mild one at that, it can be taken regularly as part of a healthy diet. This is because it’s basically just a food. And when I say mild, I mean that it provides gentle benefits in harmonious synergy with your body’s own biological processes, exhibiting minimal (if any), negative side effects. However, if you’re pregnant, it’s recommended that you take ashwagandha under the supervision of a qualified health practitioner, preferably someone well-versed in Ayurvedic medicine. Traditionally, 5-10 grams of high-quality, organically-grown Withania somnifera root powder is mixed into a glass of warm cow’s milk. This is consumed once or twice daily for optimal benefits. If you consume cow’s milk, I would recommend an organic, grass-fed, raw variety gently warmed rather than cooked at high heat, as high heat will essentially pasteurize the milk and destroy its vital enzymes. Whatever method you can tolerate is adequate. Ashwagandha supplements made from pure root powder with no fillers are another great option. The Chopra Center recommends taking ashwagandha at a dosage of 600 to 1,000 milligrams twice daily. Individuals who suffer from insomnia and/or anxiety can, again, combine the powder with a warm beverage. This can be milk, a milk substitute, or even water. Consume before bed for optimal results. If you’re really serious about aging with grace, balancing your hormones, minimizing stress, boosting your energy levels, and improving your neurological health with ashwagandha, it’s important not to forget about your diet. The fewer cheap carbohydrates, processed grains, and refined sugars you eat, the better. And remember… plenty of healthy fats, nutrient-dense proteins, and fiber-rich foods are a must. Big Mac Ingredients: Is a “Mac Attack” a Recipe for Cancer? I must admit to having some scepticism when I hear about some new concoction that is supposed to have almost magical properties to help us stay or get healthy. There are so many factors out there that can promote cancer and other serious diseases that to think that one product like Ashwaganda is going to work wonders is probably pipe dreaming. For example, if you live or work in or near a big city and around busy roads, power lines, wireless transmission towers, etc., you are likely bombarded with dozens of carcinogens in the air, on your clothes, on your shoes, in your food, in your water, etc. You would probably get more health benefits from moving to a more environmentally friendly location than trying to find that miracle drug to make everything better. Ashwaganda may well do you some good but I think we have higher priority items to consider before that product makes our list. Jake, we agree with your thoughts. A main reason we mention the patches above is the safety issues along with the benefits. The patches are Non Transdermal; nothing induced or ingested into the body and even with the millions of people using these patches about the world there have never been any harmful side effects. They can safely be used for people that have allergy to any drugs or other products and because the Glutathione patch in particular “Modulates” the raising of Glutathione it is even proving very safe for people with rare blood disorders. We have people that would die if they tried to raise their Glutathione levels any other way but are raising their level quite safely with the patches. On the subject of toxins it does not matter where you are in the world we are all being exposed to these harmful substances one way or another. We believe the Glutathione patch is the most effective method for removing toxins and other harmful substances including heavy metals from the body and the results of clinical studies and users of this patch confirm this. Where can I get the patches? Cost? How to use them? Antoinette, please email us as below and we can send you details. 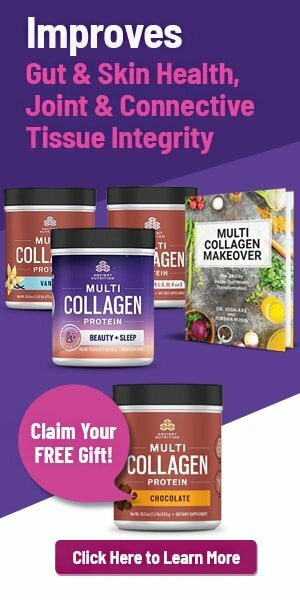 The patches do far more than simply raise Glutathione levels with patches for pain, inflammation, stress, cell repair, accelerated healing, energy, sleep problems and so many other problems often considered a precursor for cancer and other serious issues. However we do consider the Glutathione patch one of the best considerations for attaining great health and wellbeing through life. The patches DO NOT involve mixing or chasing up various herbs or ingredients as there is NOTHING ingested or induced into the body, so absolutely NO harmful side effects. How well do they detox? Just a recent example is we had had a man suffering with incurable bone pain radiating from his bone marrow for many years, apparently the effect of Lyme. One glutathione patch placed two finger widths under his belly button eased this pain to near zero overnight. He now regularly uses the patches and has a whole new life living without this deliberating pain. We are also using the Glutathione patch with people exposed to chemo with wonderful results. COST: We find the cost overall is only around a few dollars each week and they are NOT always used each week but the results are near immediate and extremely effective. One has to balance the cost of other procedures, travelling for assistance, the cost of all the medication other products one may consider (and the risks) then decide what quality of life you are seeking. We find the patches very LOW in COST compared to other products or treatments. What is the name of your facebook page? Thanks. Hi Gilda, “Lifewave Team Learning”. It is a closed group but anyone is welcome to join. Hi Gilda, it is closed group but all are welcome. Please email your Facebook name to wellnessplus@adam.com.au and we will join you into the group. Rob. Yesterdayand took one capsule before supper. I began feeling nautious with stomach cramps and ended up vomiting twice before bedtime. It is now the following day at 1:00 and I still feel miserable and I’m afraid to take any more. Any, suggestions?